@ First of all the institutions are given an awareness of the content and the salient features of the Catholic Education Policy. @ Secondly a number of promptings or ways of implementing the catholic Education Policy is offered to them in the process of doing this self study report by each institution. @ Thirdly We gather the self study report from every institution and certify the Catholic quality of the institution evaluating the extent each institution is run according to the Gospel values. After the CBCI submission of responses, as well as the responses from others including Political parties and Parliamentarians, to the MHRD regarding the TSR Subramanian draft and the MHRD draft of the National Education Policy brought out in 2016, the Government was forced to scrap the drafting committee as well as the draft as not acceptable and as promised by the by the HRD Minister, he has appointed a new Drafting Committee of 9 people and they are given the assignment to bring out a different draft by the end of 2017 which will be put up for study and response. The CBCI Secretary General and the Secretary, CBCI Office for Education and Culture met one of the members of the new drafting Committee and came to know that the new committee is given the mandate to bring out a different draft, carved out of the existing two drafts and other wide consultation reports already conducted earlier. There is no scope for fresh consultations or inputs. But is some compiled suggestions or inputs are given, they may try to look at it. 1) NCERT books being made compulsory very subtly in CBSE schools. 2) For Minority Certificate from NCMEI, register first with NITI Aayog and apply with the Unique ID number given by them. who is administering the institution??? Matter in the Supreme Court. CMC Vellore admitted one student this year leaving 99 seats vacant in protest. 4) Learning outcomes in elementary school is already announced and being implemented. Suggestions were sought from Principals in January 2017. 5) CBSE has made a U turn regarding the assessment system. It has put an end to Continuous Comprehensive Evaluation (CCE) system and gone back to Terminal examinations, Unit Tests and Note Book assessment like before. 6) CBSE Class 10 Board examinations now compulsory for class 10 students. 7) Online Affiliated Schools’ Information System (OASIS) introduced. That is Mandatory disclosure of data of CBSE schools on CBSE website. 8) Gradual safronization through introduction of Yoga, Sanskrit, subtle mistakes in text books, bringing out history books without Mughal period, down playing the role of certain National leaders etc. 9) ”Right to Free and Compulsory Education Bill” (RTE) amended again on (2.8.2017). This 2nd amendment says that all untrained teachers should get themselves qualified by 31st March 2019 or else they will have to discontinue from service after that date. To enable 11 lakh untrained teachers the Government is also giving online training through SWAYAM (Study webs for Active learning for Young Aspiring Minds) or NIOS websites. Last date for applying was 30 th September 2017. All teachers have to do their TET for teaching in schools. It can be done online. It has to be completed by 2019. 10) Stringent students’ safety rules in schools have been announced by the Supreme Court and Police Departments and Education Departments and CWCs of States after the Ryan School incident. 1) Integrated Graduation and B.Ed. in 4 years (some universities have already implemented). 2) No detention policy will be up to class 5. From class 6 onwards detention may be allowed but after giving two chances to write the annual examination (in March and June). But it will be left to the states to decide from which class to start detention. 4) Private schools are invited to become more proactive and admit 25% of students from EWS (Economically Weaker Section) by reaching out to poorer children from the neighbourhood and admitting them. The Government will reimburse the cost. 5) Staff on contract service will not be allowed anymore. 6) Government schools will compete with Private schools in giving quality education. 7) 20 out of the 200 planned institutions of excellence will be initiated immediately by Private sector. They will have total autonomy and will charge more fees as they will be asked to put in 500 crores. 8) ”Fee regulation Bill” is planned to be introduced. Some states (Gujarat) have already introduced. 1. That your institution is POCSO 2012 compliant by adopting the CBCI Child Protection Policy and procedures. 2. That your institution is compliant to “Women’s safety at work place Bill 2013” by adopting the CBCI Guidelines to deal with Sexual Harassment at Workplace. 3. That your institution implement the “All India Catholic Education Policy “and participate in the evaluation of implementation and have the institution certified. 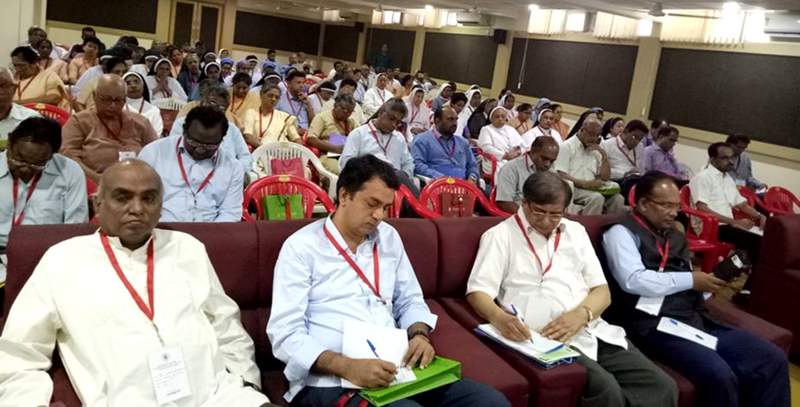 Next Archbishop Thomas D’Souza gave a short message to the participants of the National Education Consultation emphasizing the importance of coming together and working in unison in these present times to meet the challenges paused by the present day socio- political scenario. He appreciated the initiatives being taken by the CBCI Office for Education and Culture, interacting with the Government, responding to the challenges paused by the new NEP draft that has now been withdrawn and other policy related concerns that arise almost on a daily basis. 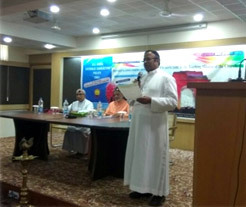 He insisted on the importance of living the Catholic identity and ensuring that our educational institutions are administered according to the All India catholic Education Policy, recalling the way the Policy was drawn up with full collaboration of the Church Hierarchy as well as the CRI and other Experts from the field of Education. He also emphasized the importance of cultivating cordial relationships with Government authorities and local leadership and all stakeholders as we carry out our education mission. He invited everyone to face the challenges and respond to the call given by the CBCI Office for Education and ensure that we impart Gospel values to the students and others whom we serve. The routine of events for both the days of the meeting and the purpose of this National Consultation; the handouts that had been enclosed within the bag and its usefulness; a copy of the “All India catholic Education Policy 2007” and the “CBCI Child Protection Policy and Procedures; the latest blog about the CBCI Office for Education and Culture that contained an updated statistics of our Education Institutions. He said that the CBCI Office was also a launching a campaign to ensure that the Good news of Catholic Education be made known and this Education Consultation was not intended to be Research Seminar or an attempt to do a Political analysis but that it was a Consultation to seek out ways to work together and find out a way forward to empower ourselves to safeguard our institutions and respond in a proactive way to face the challenges paused due to the many recent developments especially in the field of education. After which Fr. George Peter, the Director of NRC, welcomed the participants, familiarised them to the institution, its personnel, its facilities and the courses offered. The next session after the coffee break was organized by the President and Secretary General of NISA (National Independent School Alliance), Mr. Kulbhushan Sharma and Mr. Parth Shah. 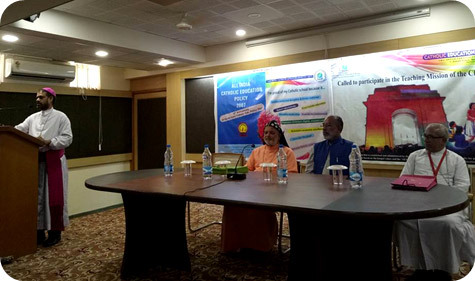 They spoke about NISA itself and the role of Budget private schools in education in India. He said that between the years 1991 and 2001, when the Government spending was down, literacy rate increased by 13% which has been the highest increase in literacy rate ever which shows the importance of the role played by Private schools in education. They went on to impress upon the participants about the need for a introducing the Voucher system of scholarship for education so that the students could have the flexibility to study in a school of their choice. They highlighted on the need and urgency in joining the National Coalition of School Education in order to take on the various challenges paused by the current day political system that was oppressive towards non governmental initiatives in education. Their presentation was followed by a few minutes of interaction with the participants seeking clarification or offering comments. The short session that followed was about ensuring the safety measures in our institutions using technology by Franciscan Solutions. They highlighted the various measures to be implemented and precautions to be taken regarding safety measures and showing also the loopholes that need to be plugged while installing equipments and putting in place technology based safety measures. @How do we admit children? Do we need to have tests and interviews? Is it not challenging God? @Where is room for creativity and innovation in our schools? @Do we need to burden the children with books and such heavy bags? @Will our students stand up for social justice? @Do we need to have this killing competitiveness in our schools? @Do we need to label children? .... Are we willing to listen etc. In conclusion, he gave his phone number and email id and offered help whenever necessary in order to help the Christian institutions to sort out problems etc. He also took a few questions from the participants for about ten minutes before he left the venue of the meeting as he had to attend to another event elsewhere. The participants however were patient and polite although they took exceptions to some things he said. 1. Reinforcing Catholic Education as an option for the poor (how the rural schools have to be of the same impact as the urban schools). 2. We must run our Catholic Schools on Gospel values (we don’t teach religion but our life, witness and practice need to echo the Gospel which brings values of human dignity). In the Open session that followed after Tea break on 24th Oct, Fr. Leslie Moras mooted the idea of having a National Federation of Christian Educational Institutions, considering the many issues and challenges that we are facing currently in the Education scenario in order to empower ourselves better through collaboration and unified efforts. The suggested associations mentioned in the discussion that followed were: Xavier Board of Higher Education, AINACS, Special Schools, Nursing Colleges, Medical Colleges. 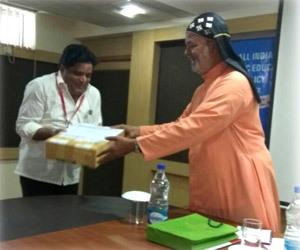 It was further suggested that the Xavier Board should take initiatives to increase its membership and get in touch to rope in the Nursing Colleges and Medical Colleges as also the AINACS should increase their membership as these are the arms of the CBCI Office for Education and Culture. It was also specified that any such National Federation should be under the CBCI Office of Education and Culture to be effective. Discussing about whether such a Federation should also include the Educational institutions / Associations of other Christian Denominations, the consensus was for more active and dynamic collaboration with them at the Regional levels while their representatives / leaders could start consultative meetings with us through the Steering Committee initiated by the CBCI Office for Education and Culture. With that the first day’s agenda was completed and the meeting was adjourned for the day at 5.00 p.m. with a short prayer by Bishop Joshua and blessing given by the Archbishop Thomas D’Souza. The second day’s programme started with a prayer session followed by an exposure programme on Protection of Children by an NGO that promotes a project named CACA (children against Child abuse), for half an hour. After the Coffee break on the second day at 11.15 A.M., a very precise presentation was made by Fr. 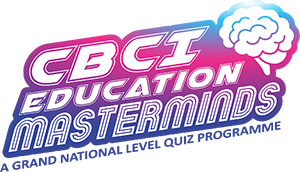 Joseph Manipadam as Advisory from the CBCI Education Office as to how to be proactive and face the challenges and safeguard our educational institutions and be committed to the Teaching mission of the Church during these turbulent times. The presentation gave very direct and practical proposals as to how to take safeguard and proactive measures by the personnel involved in education mission to ensure the institutions’ safety and commitment to the mission. 1. That we should make all efforts to forge ahead in working together in close collaboration and keep united. 2. Take forward the suggestion to form the National Federation of Christian Educational Institutions. 3. The attempt by the Government towards composite schools should be effectively countered along with like-minded people. 4. Accounts – income expenditure should be carefully maintained and become accountable in our financial administration. 5. A Catholic School logo could be introduced to show our identity and promote solidarity and belonging to the Catholic Church’s educative mission. 6. A common theme (sterna/campaign) for the year could be introduced for all our catholic Educational institutions to promote a common goal and vision annually. Summing up Bishop Joshua Mar Ignathios said that the agenda of the government was almost “why should you be doing this work of education? We are capable of doing it”. Especially in rural areas they are making it extremely difficult for us to continue with our education mission. Even in the area of our rural health facilities, they are making it very difficult to function because of the new policies that are introduced. We have seen that clearly the way the government changed the adoption policy to the extent that the Missionaries of Charity had to close down their adoption centres as the government policy collided with our Christian principles. But we need to gear up and face these challenges courageously and continue our mission of teaching as it is a mission entrusted to us by Christ. We need to give good values to the children and ensure their moral formation and bring them up as upright men and women. We must stand up for our rights and not succumb to pressures as our institutions are caring for the lost, last and the least. The proposals placed by us today regarding the National Federation of Christian Educational Institutions, having a logo and a common theme for the year can be followed up. We will take it up for discussion and approval at the next Standing Committee meeting of Bishops. Archbishop Thomas D’Souza in conclusion thanked and appreciated the persistent effort and initiatives being taken by FR. J. Manipadam and the CBCI Office for Education and Culture especially in responding speedily to the Government on policy matters and in ensuring that all our institutions comply with the Education Policy of the Church. Archbishop Thomas thanked the dynamic support and leadership and continuous encouragement being given by Bishop Joshua as Chairman of the CBCI Education Office. The initiatives and work undertaken by the CBCI Education Office from the times of RTE in 2009 and later on with the legal issues regarding the same and the NEP later on and the efforts at implementing the Catholic Education Policy etc. were all much appreciated and fruitful he remarked. 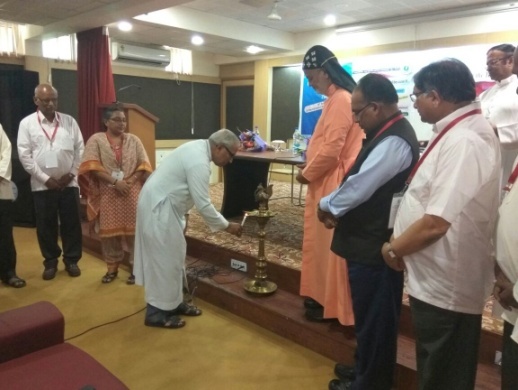 He appreciated the efforts being made in these three years at bringing together the Regional Secretaries and the Education Coordinators of Religious Orders in order to work in a united manner with a common mission. Fr. Manipadam further thanked Bishop Joshua, Archbishop Thomas for their continuous encouragement and accompaniment as he also thanked Archbishop George Anthonysamy who could not be present today but was always interested and encouraged all our efforts and activities. Finally he thanked all the participants for finding time to come for this National Education Consultation and participating with enthusiasm and appreciation. The meeting was concluded with a prayer invoking the guidance of our Blessed Mother by Bishop Joshua and both the Bishops blessing the participants.